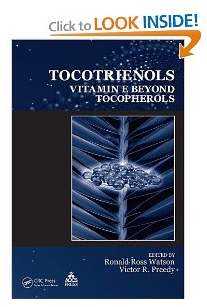 This primer is especially for the many physicians and health care practitioners who have contacted us as of late about Tocotrienol Vitamin E. We refer you to the Physicians reference guide for a great amount of research and study detail on Tocotrienol Vitamin E as well – Tocotrienols: Vitamin E Beyond Tocopherols. If you would like a copy, please contact us at 801-648-7701. Now speaking english, Tocotrienol Vitamin E is the highest form of Vitamin E, as compared to Tocopherol Vitamin E. Tocopherol Vitamin E is typically the Vitamin E sold at health markets and supplement outlets. Most people do not even know there are two forms of Vitamin E. But as you will see, the Tocotrienol Vitamin E is a very productive and effective, and more beneficial form when it comes to improving and supporting your good health. We can only begin to scratch the surface here, but consider this – The University of South Florida has conducted significant studies, and even applied for a patent utilizing Tocotrienol Vitamin E in the treatment and prevention of pancreatic cancer, which even in recent history usually meant death to patients who had the disease. Countless studies have been done (available on www.pubmed.org). Here is just a glimpse of the studies showing positive results with Tocotrienol Vitamin E and Breast Cancer. Tocotrienol is also a powerful cardio-vascular support. As shown in the numerous videos on our YouTube Channel, you can see how plaque is created in the arteries, atherosclerosis, liver issues, brain and vision can all be effected by a poor cardio-vascular system. Tocotrienol has also been shown to safely remove plaque from the arteries. Why should this matter? Plaque in the arteries narrows the arteries, hardens, and causes blood flow to be restricted. Simply said, it is kind of like stepping on a garden hose, then turning the water on full blast. The blockage from your foot will not let the water through full force, and you end up trying to wash your car with just a trickle. Do that too often, and you end up with a dirty car and buying a worn-out hose! Additional success has been experienced in utilizing Tocotrienol Vitamin E with patients who have Amyloidosis. We invite you to view our prior post on amyloidosis here. Utilizing a treatment protocol including 300-400 mg per day of Tocotrienol Vitamin E has helped to reduce the amyloid proteins stored in the heart and liver of Mr. Kim, and taken him off the transplant schedule for his heart and lungs. Mr. Kim has several family members with this same disease, who are also utilizing Tocotrienol Vitamin E in their daily routine and experiencing powerful results. It is important that you do not mistake Cardio-Care Tocotrienol as any kind of a cure-all formulation. It has its important and principal uses. Equally important is a healthy diet and proper nutritional and supplementation support for the other key functions of your body. Please take the time to follow our blog, and learn all that you can about proper nutrition and supplementation, and obtain the right formulations to restore your good health. Digestion. An amazing system, when you think about it. Probably the most intricate “plumbing” set-up in the universe. Complicated, and very easy to get “backed-up”! Especially with today’s typical active lifestyle and fast-and-quick meals on the run. when you start to learn about all of the other things going n in our environment, and realize the number of chemicals alone we have stored in our bodies, it starts to be easy to see how our pipes are getting clogged up! So how do you ensure that you have things “running smooth” in your system? Let me simplify it for you: Put good stuff in, get the bad stuff out, and pay attention to the function of your digestive system. I know that sounds simple, right? But there are so many things besides just the food you eat that can cause problems in your digestive system. For instance – did you know that your body has around 400-800 chemicals stored, mostly in your fat cells? That alone can make you sluggish. Then the low-density nutrient poor food we eat, especially fast food, puts a lot of calories in, but not a lot of nutrition at the cellular level. then our bodies slow down or even cease in the production of essential enzymes and digestive juices. And without the proper balance and pro-biotics in our digestive tract, we can’t expect that system to work well at all! Here’s the good news. There is something you can do about it. A good quality detox can hep to clear the toxins and chemicals from your system. And getting good nutrition, in the form of supplementation, greens, vegetables and fruits, the right proteins and enzyme support can make all the difference in getting your system working well again. There are simple changes you can make to restore your digestive health. Take the steps necessary to be your own “plumber” and get those pipes clean again. If you are a diabetic you know how important managing your blood sugar is. That means managing triglycerides, and ensuring your body can process and digest the foods you eat and get the nutrition you need from them. Enzymes are an important part of this process. And finding the support your body needs to do all three of these is key. That’s why it is important that you not only find support from all natural 100% botanical supplements, but that those supplements are formulated in such a way that your body can utilize them. There is incredible power in having the right formulations. As for getting your triglycerides in balance, you should really explore tocotrienol vitamin E. This is NOT the regular vitamin E you can buy over the counter. That is typically tocopherol vitamin E, which is the lower grade of the vitamin. You can see the independent research on tocotrienol at pubmed.gov. Just type in tocotrienol and diabetes. You will see so much validation on tocotrienol’s ability to help manage triglycerides. And help fight off other cardiovascular and diabetes related heart and stroke issues as well. You can get this premium-grade supplement at Xinko Global. At the change of each season, you should have a good deep-clean from a powerful, yet gentle, detoxification protocol. Xinko Global offers an all-natural botanical detox protocol called Pure. Offering you a non-explosive, complete detoxification support that provides a cleansing of the body’s digestive and related systems. Pure contains vitamins, minerals, enzymes, dietary fiber, acidophilus, and several known herbal systemic cleansers and detoxifiers.We recommend that every individual complete a detoxification support program prior to initiating a nutritional program. This detoxification program can also be beneficial at the beginning of any weight loss program. Pure is most effective when done every 6 – 8 months. Individuals who live in an industrial or urban environments, this should be performed every 3-4 months. A powerful detoxification protocol can boost your immune system’s ability to react to cold and flu, and prepare you for an increase in activity such as summer season where you tend to become more active outdoors. These are the key items contained in this powerful detox program:Zymes: a two-stage digestive aid formulated to promote proper digestion in the stomach (stage 1) and the intestines (stage 2), thus cleaning and detoxifying the intestinal tract. This proprietary blend contains pepsin, bile salt, amylase, protease, lipase, bromelain, and papain. Pro-Bio: an acidophilus consisting of over 12 different strains. A probiotic formulated to help restore and maintain normal flora in the intestinal tract. This proprietary blend contains lactobacillus plantarum, lactobacillus, rhamnosusand, bifidobacterium bifidum, bifidobacterium infatis, bifidobacterium longum, enterococcus faecium, lactobacillus acidophilus, lactobacillus casei, lactobacillus helveticus, lactobacillus salivarius, pediococcus acidilactici, and streptococcus thermophilus, apple pectin, and rice powder. Daily Basic : a powerful iron-free multivitamin/mineral supplement specifically formulated for the needs of today’s active lifestyle. It promotes good health and vitality by providing important nutrients that support against free radicals, slow the aging process, and support a cleansing and detoxification of the body. Fibre: an all-natural fiber that expands to fifty times its original size in the stomach. This fibrous material works to clean the intestinal tract. This proprietary blend contains galactomannan, and glucomannan..
K-Filter: designed to support the kidney and bladder. It primarily supports improved circulation, and nutrition to the kidney tissue. Lymph: supports the lymphatic system by improved circulation and detoxification. This proprietary blend contains sassafras root bark, burdock root, dandelion root, foenugreek, and prickly ash bark. L-Cleanse: a liver and gallbladder support that activates, tones, and increases secretions, causing detoxification. This proprietary blend contains barberry root bark, blessed thistle, dandelion root, boldo leaves, black radish seed, wild yam root, Fennel seed, and cloves. When undertaking a detoxification program, you want to ensure that you are not utilizing any products that introduce chemical or artificial stimulants into your body. Equally important is the need to ensure that although the products are all-natural, you do not want any chemically extracted ingredients either. Xinko Global’s formulation Pure has neither of these in its formulation or production. Learn more about environmental toxins and their impact on your body by watching our Total Health Program Videos 1 and 2 on the Xinko Global YouTube Channel at www.youtube.com/user/xinkoglobal. And get your PURE detoxification program at www.xinkoglobal.com – under “Shop”. Clean your “house” today! Has someone you love been touched by cancer? Would you like to help prevent it from coming back, or support them in their recovery? Here is a powerful combination that can help you do just that. And perhaps prevent it for yourself as well. Two important functions matter – one, cut off the food supply to abnormal or defective cells. And two, get those same abnormal or defective cells to self-destruct, or perform a function called “apoptosis”. In order to accomplish this, you need to establish proper pH balance of 7.0 – 7.3. This is easy to test, using a very inexpensive pH test paper available at most pharmacies or drug stores. To ensure you can obtain and then maintain a proper pH, you will need to not only test to see where you are, but use a daily support product to assist your body in proper pH balance. Xinko Global’s pH7 does just that. It aids in reducing or eliminating toxins and heavy metals in the body. It also contains nutrients and trace minerals suspended in a humic and fulvic acid base. A few drops a few times per day can make a huge difference in maintaining a proper pH balance, and thus aid in cutting off the food supply to abnormal and defective cells. Getting those sells to self-destruct is a process called apoptosis. The role of apoptosis in cellular death can be complex, simply stated, it is the process by which cancer cells are triggered for cellular destruction. Tocotrienol Vitamin E (not to be confused with tocopherol vitamin E which is commonly sold over-the-counter) can be a catalyst to effecting apoptosis in these abnormal or defective cells. Tocotrienol Vitamin E is well known for its powerful reduction of plaque in arteries, and thus also supports delivery of proper nutrition at the cellular level. As such, the combination of pH7 establishing the proper pH and cutting off the food supply to abnormal cells, and tocotrienol vitamin E triggers apoptosis of the cells, you can fight against these cancerous growths and potentially prevent further growth. To learn more about tocotrienol and other components of these two powerful products, you should research the thousands of independent scientific studies at http://www.pubmed.gov. And be sure to obtain these powerful formulations at www.xinkoglobal.com – pH7 and Cardio-Care. A powerful 1-2 punch in your fight against cancer. If you’d like more information on a powerful and safe formulation to help in the battle against breast cancer, pancreatic cancer and stroke, as well as clearing plaque from the arteries and prevention of heart and cardiovascular issues, click here today. What do you know about Tocotrienol? Whatever it is, there is more! Did you know, for instance, that there is much credible evidence that Tocotrienol can help prevent stroke? We could say so much here, but really, one key way to find out more is to watch this video. Then, go to www.pubmed.gov. There are several scientific studies posted there supporting that tocotrienol can prevent stroke. Fast Forward – to Xinko Global’s Cardio-Care formulation. Which contains 100mg of Tocotrienol per capsule. The largest dosage in the marketplace. And, which also has the needed co-factors and enzymes to maximize assimilation of the Tocotrienol for use in the body. This is one of those every-day use necessity products. Research Tocotrienol! See its many benefits. And learn how this powerful formulation can improve and lengthen your life! Vitamin C is a very powerful antioxidant that also protects other antioxidants such as Tocotrienol vitamin E. It protects the cells of the brain and spinal cord, which incur the most free radical damage. It detoxifies many harmful substances and plays a key role in immunity and stimulates certain key immune cells. Selenium enhances Tocotrienol uptake, and these two nutrients should be taken together as it is a partner and synergist for Tocotrienol. Selenium is also an essential component of the important antioxidant enzyme glutathione peroxidase that targets harmful hydrogen peroxide. It is very important for heart, liver and lungs. Selenium also stimulates increased antibody response to infection. and absorption of zinc are needed to maintain the proper concentration of vitamin E in the blood. Glucomannon is a fiber known to collect and remove fats from the colon wall. It also has the shown to support normalization of blood cholesterol, triglycerides and low-density lipoproteins in the blood, binds with toxic substances and carries them out of the body. Grape Seed Extract has a great concentration of Tocotrienol vitamin E, flavonoids, linoleic acid and OPCs. (oligomeric proanthocyanidins) recognized as anti-oxidants. Grape seed extract may be useful to treat heart diseases such as high blood pressure and high cholesterol by inhibiting platelet aggregation and reducing inflammation. Resveratrol is an anti aging supplement that contains many other beneficial effects aside from its ability to make you look and feel younger. Enzymes in the body called sirtuins (silent information regulator proteins) act as protection for cells and enhance their ability to survive. These sirtuins have been shown to increase DNA stability and speed cellular repair.”We think sirtuins buy cells time to repair damage,” says molecular biologist David Sinclair, Assistant Professor of Pathology at Harvard Medical School and co-author of the study. It is believed that the self-destruction of cancer cells, a process known as apoptosis, is activated by Resveratrol. Pomegranate can reduce your levels of cortisol, the stress hormone in saliva and reduce systolic and diastolic blood pressure. It also has been shown to lower cholesterol levels and reduce the risk of Alzheimer and arthritis. EDS our proprietary blend of enzymes that speeds digestion, improve absorption and increases bioavailability. ADPT our proprietary blend of Adaptogens (Eleuthero, Reishi, Ganoderma, Jiaogulan, Cordyceps, and Rhodiola Rosea) that support the countering the adverse effects of stress, increase energy, increase the body’s resistance to a broad range of adverse influences, and have a normalizing effect, improving many conditions while aggravating none. Adaptogens give the body a tune-up. They help the cells produce energy and use it more efficiently. These comments have not been evaluated by the FDA, and are not intended to diagnose, treat, prevent, or cure any disease. For more information about the importance of co-facturs and creation of proper formulations, see our earlier post regarding formulations, and watch the videos on our Xinko Global YouTube Channel. Inhibit cholesterol production in the liver, thereby lowering total blood cholesterol. Alpha Tocotrienol inhibit the biosynthesis of cholesterol. Tocotrienols have been shown to suppress cholesterol biosynthesis and reduce cholesterol level. Combination of gamma-tocotrienol and alpha-tocopherol is found as a potential hypolipemic agent in hyperlipemic humans at atherogenic risk. Tocotienols inhibit cholesterogenesis by suppressing HMG-CoA reductase. Tocotrienols have anti-aggregation effect on blood platelets which will inhibit the thrombosis process. Alpha and Gamma-Tocotrienols have shown to prolong the life span of cancer-infected mice. Tocotrienols inhibited tumour cell growth of HELA and P388 cells in culture. Gamma-tocotrienols is 3 times more potent in inhibiting growth of human breast cancer cultured cells than Tomoxifen. Alpha Tocotrienol showed better antioxidant activity than alpha-tocopherol in rat liver microsomal membrane. Antioxidants such as palm tocotrienols caused regression in carotid artery stenosis. Palm oil vitamin E significantly protects against ischemia/ reperfusion injury in the isolated perfused Langendorff heart. Prevents deficiencies caused by excess polyunsaturated oils, chlorinated drinking water, hormone contraceptives and menopause. The discovery of tocotrienols was first reported by Pennock and Whittle (USDA, Liverpool) in 1964, describing the isolation of tocotrienols from rubber. The biological significance of tocotrienols was clearly delineated in the early 1980s, when its ability to lower cholesterol was first reported by Qureshi and Elson (UWisconsin/Madison). During the 1990s, the anti-cancer properties of tocopherols and tocotrienols began to be delineated. The current commercial sources of tocotrienol are rice, palm, and annatto. The ratio of tocopherol-to-tocotrienol in rice, palm, and annatto is 50:50, 25:75, and 0.1:99.9, respectively. . α-tocopherol makes up roughly 25-50% of palm and rice vitamin E mixtures, respectively, and has been shown to interfere with tocotrienol benefits. Annatto, on the other hand, naturally contains only δ- and γ-tocotrienols and is essentially tocopherol-free, hence not confined by α-tocopherol interference issues. Other natural tocotrienol sources include rice bran oil, coconut oil, cocoa butter, barley, and wheat germ. Sunflower, peanut, walnut, sesame, and olive oils, however contain only tocopherols. Vitamin E supplements typically supply 50–200 mg/day of mixed tocotrienols. In a number of clinical trials, doses of tocotrienols as low as 42 mg/day have shown to reduce blood cholesterol levels by 5%-35%. Tocotrienols are safe and human studies show no adverse effects with consumption of 240 mg/day for 48 months.